Thanks for writing this post. The topic is interesting! Do you have an example where this belief would be true? I was thinking first about a case where a tester tells a programmer what kind of tests he would start with. But after thinking about it for a while, I don’t think this would be antifragile. Secondly I thought about a case where a tester tries to find bugs from the software and the programmers try to team up against those bug reports. This might be in the antifragile category, and it might even work with some people, but initially it sounds like hard to implement. Even dangerous and something that I see potentially harming the value understanding of testing. However, I have seen how programmers and testers work together so that they protect themselves from the client. Would that be antifragile to you? Initially that also sounds like hard to implement in a constructive manner. What do you mean with testers ensuring the project has small problems? Would any “small” (obviously, we could philosophize about the meaning of “small”) problem suffice or the problem would need to be of certain kind? Could you give an example of such a problem that will lead to antifragility? I am also wondering if we could draw a heuristic line(s) somewhere for a problem being too big for causing antifragility. I think retrospective (or any kind of situation where the work is analysed) could be seen as a catalyst for potentially antifragiling (that doesn’t sound like a real word) the product and/or the team. A good retrospective could give input for further planning and/or design. I’d like to see comments and ideas around the topic as it’s rather new to me. Sounds like something I would like to explore a lot more. Hi Jari, thanks for commenting. I’m glad you find the topic interesting. In software, we’re usually not very good at doing things in antifragile ways. I’m afraid I can’t come up with a well known example. I agree with you that any kind of teaming up to protect teams from clients is a bad idea, and might also indicate fragility. The same would apply to your example where “programmers are teaming up against” bug reports. They key word here is “against”: To be antifragile, you have to work with your testers, not against them. Testers and developers can compete against each other, but not work against each other. Ask yourself: Is a process more like something inside a washing machine, or is it like a cat. The cat is the antifragile. “Small” is anything that doesn’t destroy something. 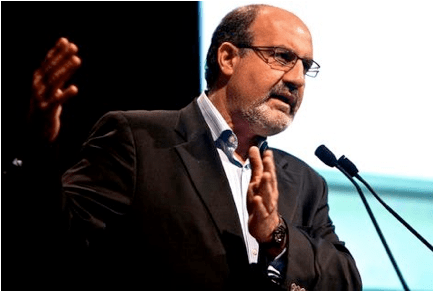 Taleb uses the following example: If you jump 10 times from a wall 1 m high, you will stress your body in a non-destructive way and your organism will grow stronger. But if you jump once from a wall 10 m high, you’ll probably die. Antifragility only works to a certain level. So in a software project, it’s often better to find 10 medium-severity bugs than 1 show stopper. Why? Because while show stoppers are always fixed, they are usually “only fixed”. Nobody cares why they showed up in the first place. Not all of the 10 medium severity bugs, but it is my experience that programmers working with them start thinking and looking for patterns. They start anticipating other problems, and often fix them before you get a chance to test it. But we could also say that any bug found in testing is a “small problem”. At least compared to bugs found in production, which can be very “big problems”, even if they’re trivial. I agree very much that a retrospective generally supports antifragility. Great post and great comment. I agree that we can induce some anti fragility by bringing in experts early – an example I have seen is in using expert “crowd-sourced(it shd be community sourced? )” exercises to detect and then address behaviours in an exploratory mode. they catch many failure points that conventional tests and testers ignore because of the latter’s fixation with requirement conformity. This works specially well with ecommerce/social sites I’d think.. On second thoughts I feel that even the testing in production is designed to increase anti fragility by inducing lower stressors on the system? Thank you for the interesting article! I would add one additional step: an automated test which checks that the bug has been fixed. In my humble opinion, that’s the only way to really ensure that the system has been cured from that bug. I wrote a blog article about this some time ago: http://www.getautoma.com/blog/kill-bugs-dead. Maybe you’ll like it! I’m glad you like the article. Automated checks are more like washing machines than cats to me, so by themselves, they cannot support antifragility. Thanks for the reference to your blog, which I will read later. On trial and (small) error: Taleb is careful to note that there are different aspects to “small” when we’re thinking about error. In software, the error itself may be small and easy to fix (say, a one-byte typo), but the consequences can be monstrous (your spacecraft augurs into the surface of the planet) . Similarly, you can make a whopping mistake in your conception of something (say, completely misunderstanding how some process works, and programming it based on your misunderstanding). Yet if the problem is discovered as part of the tinkering processes of exploratory development and testing, the problem can be fixed before the product is released, and thus the consequences of the errors are small. Taleb talks about this in his essay on the Fourth Quadrant, which also appears in the second edition of The Black Swan. On fragility vs. robustness vs. antifragility: The opposite of “fragile” is not “robust” or “resilient” or “strong”. As Taleb points out, robust things merely stand up to randomness, turbulence, disruption, and stress. Anti-fragile things benefit from stress and perturbation. This leads to a key distinction between two different approaches to testing. Confirmatory testing (or checking) emphasizes repetition and anticipated problems. A confirmatory approach probes for reliability in the sense of consistency, reinforcing the idea that what we knew before remains the same. We live in a changing, variable, complex, surprising (and human!) world, An exploratory approach emphasize tinkering, experimentation, galumphing, and unanticipated problems. An exploratory approach probes for reliability in the sense of adaptability to the unexpected. As Anders points out, this makes the system of development anti-fragile, benefiting from mild stress. But, alas, it doesn’t make the technology itself robust; at best, it pushes the very fragile in the direction of the somewhat-less-fragile. Finally, I disagree with Michael, above, An automated test does not check that the bug has been fixed; it can’t do that. An automated test (an automated check, really), at best, speeds up our ability to check that the program’s behaviour conforms to some specific expectation. That expectation is fragile. However, automation CAN be used in the service of an exploratory approach when we combine with with variation (especially) randomization and a high-speed oracle. So certain kinds of automation can help to drive discoveries; that’s anti-fragile. Thank you very much, Michael, for your clarifying and cautionary notes! Anders – Thank you for this insightful post. I think the Apollo example you gave is an excellent example of what Taleb identified as deep redundancy. That is redundancy in engineering, technical, and management practices at the time. That allowed the team to quickly shift the mission and save the astronauts. The concepts he presents in that book are very deep and I believe strike at the core of what we should be paying attention to in software development and testing.